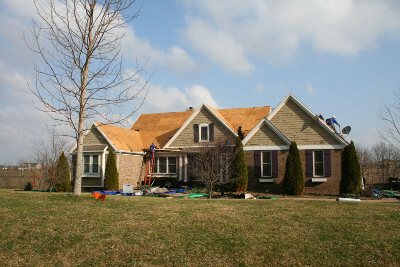 Roofing Contractor Georgetown KY - Best in Scott County! We offer superior service as your roofing contractor in Georgetown, KY. As local experts we provide commercial and residential services for roofs including new installations, repairs and replacement. In addition to our standard services we also provide roof inspections for real estate transactions, storm damage inspections and insurance claim roofing repairs. With our services you’ll get an honest evaluation of your needs accompanied by true craftsmanship for your shingle, slate and metal roof installations. As always, we have ongoing work in the area. Below is an outline of our most recent completed job. We like to provide you, as our next client an understanding of how we take on our work. Maybe your next repair or installation will be similar to the following. Water spots in bathroom ceiling next to the vent. Hand delivered work proposal to homeowner for replacing old flashing with new. We were able to make all necessary repairs to prevent future water damages. Also during our process we made sure the flashing on the roof was properly installed and matched the existing shingles with ease. Our time on this job was a 1/2 days work. The homeowner was satisfied and thankful that they were able to prevent future costly damages to their home. Thank you for providing your services so professionally. I appreciate you finding my leak and walking me through your procedures. We are committed to excellence as your residential roofing company in Georgetown. Our clients tell the story for us. 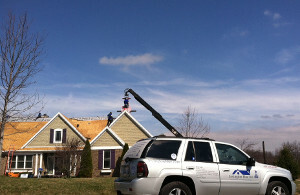 As a BBB A+ rated roofer, you can rest assured that your getting quality service and workmanship. Our residential services include patching roof leaks, new shingle installations, shingle repair, siding repair, gutter installation, roof repair, metal roofing, ventilation systems, re-roofing, window maintenance and storm damage replacement for roofs. If you’re building your new home, need to color match your shingles or just need advice we can help! There are several great roofers in Georgetown, but our focus is to set a higher standard of doing business and experience for our clients. From the initial meet and greet to the final shingle being installed, you’ll feel the difference. Our promise is to provide an unbiased recommendation for your roofing needs and walk you through every detail of your project. We have warranties ranging from 5 year full comprehensive on our work up to a 50 year limited transferable warranty. Contact us for professional service.